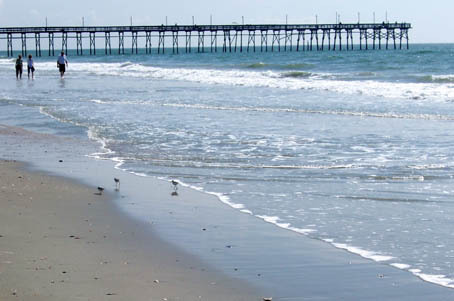 This photo illustrates the similar paths of the birds and the beach combers wading in the surf together. Three people are meeting three birds. Who will give way? Just googling about the internet and thought Id look Hallie up and found this site. 🙂 Is this the Sunset Beach pier? Hi Katie!!!. No it is Ocean Isle but ….you were close. How exciting to hear from you…..I forwarded this to Hallie. She is swamped right now so may not reply right away. I hope you and your parents are great. Thanks for commenting.